Definition at line 183 of file message.h. Definition at line 182 of file message.h. Definition at line 175 of file message.h. Definition at line 138 of file message.h. Definition at line 2665 of file message.cpp. 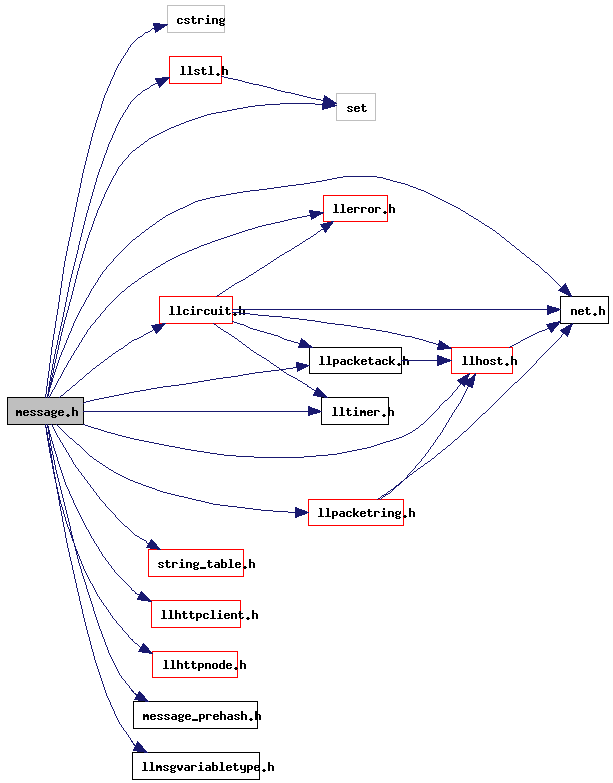 References LLTransferManager::cleanup(), gMessageSystem, gTransferManager, llendl, llinfos, NULL, LLMessageSystem::stopLogging(), LLMessageSystem::summarizeLogs(), and LLTransferTargetVFile::updateQueue(). Definition at line 798 of file message.h. References i, llendl, llerrs, MVT_BOOL, MVT_F32, MVT_F64, MVT_FIXED, MVT_IP_ADDR, MVT_IP_PORT, MVT_LLQuaternion, MVT_LLUUID, MVT_LLVector3, MVT_LLVector3d, MVT_LLVector4, MVT_S16, MVT_S16Array, MVT_S32, MVT_S64, MVT_S8, MVT_U16, MVT_U16Quat, MVT_U16Vec3, MVT_U32, MVT_U64, MVT_U8, MVT_VARIABLE, s, and S32. Referenced by LLMsgVarData::addData(), buildBlock(), LLTemplateMessageReader::decodeData(), LLGestureList::deserialize(), LLGesture::deserialize(), ntohmemcpy(), LLDataPackerBinaryBuffer::packBinaryData(), LLDataPackerBinaryBuffer::packBinaryDataFixed(), LLDataPackerBinaryBuffer::packColor4(), LLDataPackerBinaryBuffer::packColor4U(), LLHUDEffectSpiral::packData(), LLHUDEffectPointAt::packData(), LLHUDEffectLookAt::packData(), LLHUDEffectBeam::packData(), LLDataPackerBinaryBuffer::packF32(), LLSelectMgr::packMultipleUpdate(), LLDataPackerBinaryBuffer::packS32(), LLDataPackerBinaryBuffer::packString(), LLTextureAnim::packTAMessage(), LLPrimitive::packTEField(), LLDataPackerBinaryBuffer::packU16(), LLDataPackerBinaryBuffer::packU32(), LLDataPackerBinaryBuffer::packUUID(), LLDataPackerBinaryBuffer::packVector2(), LLDataPackerBinaryBuffer::packVector3(), LLDataPackerBinaryBuffer::packVector4(), LLViewerObject::processUpdateMessage(), LLXfer::sendPacket(), LLGestureList::serialize(), LLGesture::serialize(), LLDataPackerBinaryBuffer::unpackBinaryData(), LLDataPackerBinaryBuffer::unpackBinaryDataFixed(), LLDataPackerBinaryBuffer::unpackColor4(), LLDataPackerBinaryBuffer::unpackColor4U(), LLHUDEffectSpiral::unpackData(), LLHUDEffectPointAt::unpackData(), LLHUDEffectLookAt::unpackData(), LLHUDEffectBeam::unpackData(), LLDataPackerBinaryBuffer::unpackF32(), LLDataPackerBinaryBuffer::unpackS32(), LLTextureAnim::unpackTAMessage(), LLPrimitive::unpackTEField(), LLDataPackerBinaryBuffer::unpackU16(), LLDataPackerBinaryBuffer::unpackU32(), LLDataPackerBinaryBuffer::unpackUUID(), LLDataPackerBinaryBuffer::unpackVector2(), LLDataPackerBinaryBuffer::unpackVector3(), and LLDataPackerBinaryBuffer::unpackVector4(). Definition at line 958 of file message.h. Definition at line 3305 of file message.cpp. Referenced by callback_prepare_video(), LLMessageSystem::establishBidirectionalTrust(), LLAudioStreamMediaListener::handleEvent(), idle_startup(), register_viewer_callbacks(), and start_messaging_system(). Definition at line 2470 of file message.cpp. References _PREHASH_AddCircuitCode, _PREHASH_CloseCircuit, _PREHASH_CompletePingCheck, _PREHASH_CreateTrustedCircuit, _PREHASH_DenyTrustedCircuit, _PREHASH_OpenCircuit, _PREHASH_PacketAck, _PREHASH_StartPingCheck, _PREHASH_UseCircuitCode, close_circuit(), dump_prehash_files(), FALSE, g_shared_secret, gMessageSystem, gPrehashVersionNumber, gTransferManager, LLTransferManager::init(), init_prehash_data(), LLMessageSystem::isOK(), llendl, llerrs, llinfos, LLMessageSystem::mMessageFileVersionNumber, NULL, null_message_callback(), open_circuit(), process_complete_ping_check(), process_create_trusted_circuit(), process_deny_trusted_circuit(), process_packet_ack(), process_start_ping_check(), LLMessageSystem::processAddCircuitCode(), LLMessageSystem::processError(), LLMessageSystem::processUseCircuitCode(), LLMessageSystem::setHandlerFunc(), LLMessageSystem::setHandlerFuncFast(), and TRUE. Referenced by tut::LLTemplateMessageBuilderTestData::defaultTemplate(), idle_startup(), and tut::LLMessageSystemTestData::LLMessageSystemTestData(). Definition at line 49 of file message_string_table.cpp. Referenced by LLMessageSystem::addBinaryData(), LLMessageSystem::addBOOL(), LLMessageSystem::addF32(), LLMessageSystem::addF64(), LLMessageSystem::addHandlerFunc(), LLMessageSystem::addIPAddr(), LLMessageSystem::addIPPort(), LLMessageSystem::addQuat(), LLMessageSystem::addS16(), LLMessageSystem::addS32(), LLMessageSystem::addS8(), LLMessageSystem::addString(), LLMessageSystem::addU16(), LLMessageSystem::addU32(), LLMessageSystem::addU64(), LLMessageSystem::addU8(), LLMessageSystem::addUUID(), LLMessageSystem::addVector3(), LLMessageSystem::addVector3d(), LLMessageSystem::addVector4(), LLMessageSystem::callHandler(), check_for_unrecognized_messages(), LLMessageSystem::delHandlerFunc(), LLMessageSystem::dispatch(), dump_prehash_files(), tut::LLSDMessageReaderTestData::ensureMessageName(), findTemplate(), LLMessageSystem::getBinaryData(), LLMessageSystem::getBOOL(), LLMessageSystem::getF32(), LLMessageSystem::getF64(), LLMessageSystem::getIPAddr(), LLMessageSystem::getIPPort(), LLMessageSystem::getNumberOfBlocks(), LLMessageSystem::getQuat(), LLMessageSystem::getS16(), LLMessageSystem::getS32(), LLMessageSystem::getS8(), LLMessageSystem::getSize(), LLMessageSystem::getString(), LLMessageSystem::getU16(), LLMessageSystem::getU32(), LLMessageSystem::getU64(), LLMessageSystem::getU8(), LLMessageSystem::getUUID(), LLMessageSystem::getVector3(), LLMessageSystem::getVector3d(), LLMessageSystem::getVector4(), init_prehash_data(), LLMessageSystem::isMessage(), LLMessageSystem::isSendFull(), LLMessageBlock::LLMessageBlock(), LLMessageTemplate::LLMessageTemplate(), LLMessageVariable::LLMessageVariable(), LLMessageSystem::newMessage(), LLMessageSystem::nextBlock(), LLMessageHandlerBridge::post(), tut::LLMessageTemplateParserTestData::prehash(), and LLMessageSystem::setHandlerFunc(). Definition at line 1800 of file message.cpp. Definition at line 134 of file message.h. Referenced by LLMessageSystem::checkMessages(), and LLMessageSystem::sendMessage(). Definition at line 147 of file message.h. Referenced by LLMessageSystem::sendReliable(), and LLTransferSourceChannel::updateTransfers(). Definition at line 157 of file message.h. Definition at line 158 of file message.h. Definition at line 159 of file message.h. Definition at line 148 of file message.h. Referenced by LLCircuitData::resendUnackedPackets(), and LLMessageSystem::sendReliable(). Definition at line 149 of file message.h. Referenced by LLMessageSystem::flushSemiReliable(), and LLMessageSystem::sendSemiReliable(). Definition at line 137 of file message.h. Referenced by LLMessageSystem::checkMessages(), LLTemplateMessageReader::decodeTemplate(), and LLMessageSystem::zeroCodeExpand(). Definition at line 150 of file message.h. Definition at line 132 of file message.h. Definition at line 156 of file message.h. Definition at line 133 of file message.h. Referenced by LLMessageSystem::checkMessages(), and LLCircuitData::resendUnackedPackets(). Definition at line 155 of file message.h. Definition at line 131 of file message.h. Referenced by zero_code(), and LLMessageSystem::zeroCodeExpand(). Definition at line 129 of file message.h. Referenced by LLTemplateMessageBuilder::isMessageFull(), and LLTemplateMessageBuilder::nextBlock(). Definition at line 128 of file message.h. Referenced by buildBlock(), LLMessageSystem::sendMessage(), zero_code(), LLMessageSystem::zeroCodeAdjustCurrentSendTotal(), and LLMessageSystem::zeroCodeExpand(). Definition at line 161 of file message.h. Definition at line 127 of file message.h. Definition at line 69 of file message.h. Definition at line 66 of file message.h. Definition at line 67 of file message.h. Referenced by dump_prehash_files(), LLMessageStringTable::getString(), LLMessageStringTable::LLMessageStringTable(), and message_hash_my_string().